Video recently surfaced of a dog who refused to leave behind an injured hound amid the devastation in Japan. Animals have often shown bravery in extraordinary circumstances. TIME takes a look at some of history's most courageous animals. Pigeons aren't often thought of as the smartest of our feathered friends, but the incessantly cooing, bread-crumb-eating birds have their uses. During World War I and World War II, the U.S. military enlisted more than 200,000 pigeons to conduct surveillance and relay messages. One such pigeon, Cher Ami ("Dear Friend" in French), flew for the U.S. Army Signal Corps in France during WWI. He flew 12 important messages before being struck by enemy fire. Despite being shot in the breast and leg, he managed to deliver the message, which was found dangling from his shattered leg. His brave dedication to the mission led to the rescue of 194 soldiers in Major Charles Whittlesey's "Lost Battalion." 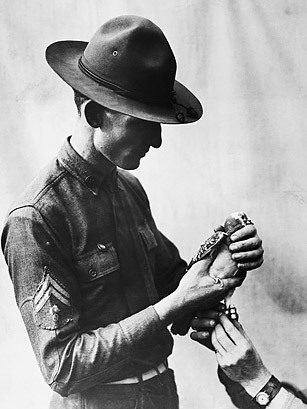 Cher Ami, who died in 1919, likely as a result of his battle wounds, was awarded the French Croix de Guerre award for his heroic service and was inducted into the Racing Pigeon Hall of Fame. His one-legged body is on display at the Smithsonian National Museum of American History's "Price of Freedom: Americans at War" exhibit in Washington, D.C.
See the top 10 militant animals.